DLECTRICITY is a free nighttime, outdoor contemporary art festival which will invite emerging and established artists, performers, lighting designers, and architects to make site-specific installations of light, sound, performance and projection – transforming the Woodward corridor into an illuminated urban spectacle for thousands of visitors. 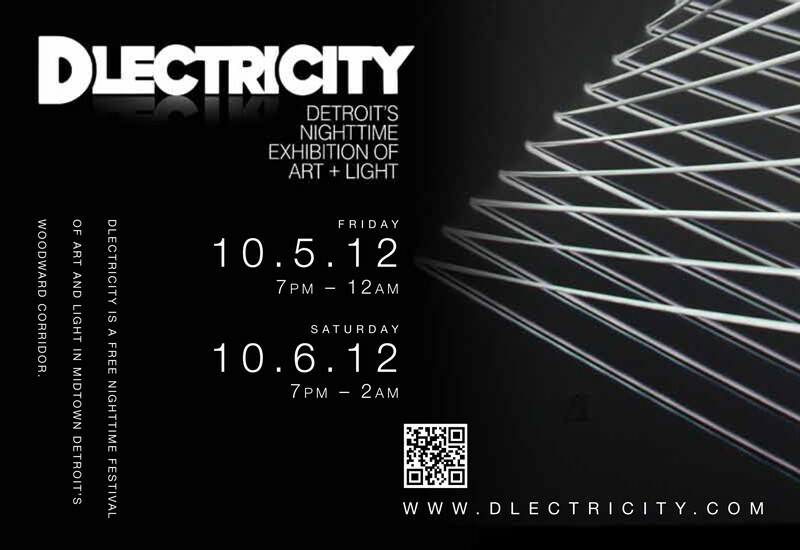 DLECTRICITY will be held Friday, October 5, from 7 pm – 12 am and Saturday, October 6, from 5 pm – 2 am.For two electrifying evenings, Midtown Detroit will be enveloped in a sea of light as a number of artists converge on Detroit to “light up” buildings and city spaces in Midtown using various mediums that meld sci-fi technology with Victorian spectacle on a grand scale. In an attempt to bring contemporary art to the masses, DLECTRICITY aspires to engage a broad and diverse audience, create a sense of community and be a place for stimulation and discussion about the impact of art on public spaces. The city landscape will be transformed into temporary exhibitions, inviting the public to rediscover these spaces and see them in a new light. UNSTABLE will present its participative light installation YOUR TEXT HERE. The DLECTRICITY Curatorial Committee received more than 200 submissions from emerging and established artists, lighting designers, and architects through an open call for entry process. From that, the committee selected 25 projects and performances based on a number of criteria, including artistic merit and how well the project uses various media like light, video projection, interactivity, 3D video mapping, and other creative technologies, as well as how the projects exist within an urban environment. In addition, curatorial committee members invited 10 local and international artists specializing in light and technology projects to bring their expertise to Detroit’s first “Nuit Blanche” event.